OMAHA, Neb. — A groundbreaking was recently held as part of a Nebraska building project that will erect a church, synagogue and mosque side by side on the same property. Temple Israel, the American Muslim Institute and Countryside Christian Church claim that they are being led by God to create the multi-faith location in Omaha. “We believe that we are being led by our God to continue the journey started by Abraham and that we are all called to be a blessing to each other and our community,” the FAQ section of the Tri-Faith Initiative website outlines. It says that the effort combines the three because of their shared Abrahamic faith and their belief that they all worship the same God. The “Tri-Faith Initiative” has been in motion since 2006, with Countryside Christian Church being the last to break ground. It held its ceremony on June 5. Temple Israel opened its new $21 million dollar facility in 2013, and the American Muslim Institute completed its $7 million mosque in the spring, opening this month. 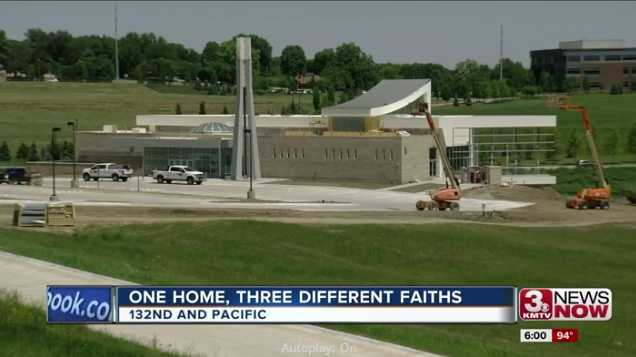 A tri-faith center is also expected to be completed in 2019, and will be used for interfaith activities. “Tri-Faith Initiative is already sponsoring activities including speaking engagements, a children’s program, shared holidays between congregations, an annual picnic, and others,” its website outlines. While Countryside Christian Church, part of the United Church of Christ, already has a building 15 minutes away from the location, it said it wanted to join the effort because it liked the concept. Elnes said that the majority of his congregation voted for the move, while some reports state that the matter divided the assembly. “We are moving simply because we fell in love with the vision of Tri-Faith,” he said. While some laud the initiative as a peacemaking move, others have expressed concern. The Global Faith Institute, led by Dr. Mark Christian, a former Muslim turned Christian, has several posts on its website about the matter. “The fundamental schism in Islam between Sunni and Shia is irreconcilable and has resulted in centuries of strife and violence within Islam. The idea that a mosque exists, that is open to both sects equally; in close physical proximity and partnership with Jews and Christians, makes this project a very appealing target for extremists of all stripes who might wish to make a statement using violence,” he opined. The daughter of billionaire investor Warren Buffet, Susie Buffet, is stated to be one of the financiers of the project, according to the Kansas City Star. Buffet is a member of Countryside Christian Church.